This article focuses on Weather Intelligence, which is available on all Generation 1 and Generation 2 Rachio controllers. 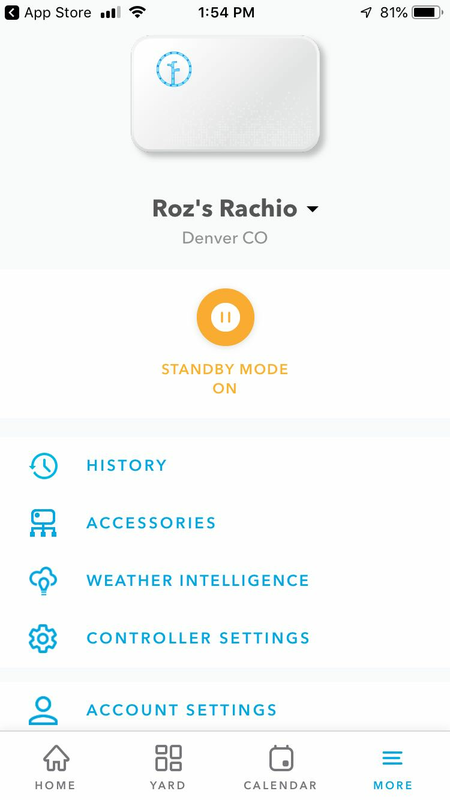 If you have a Rachio 3, check out our article on Weather Intelligence™ Plus, the new and improved feature available on all Rachio 3 Smart Sprinkler Controllers! Weather Intelligence consists of different features that act as weather triggers to skip the watering schedule or adjust watering durations. The schedule creator enables all of these settings by default. Editing these settings after schedule creation is easily done, on a per-schedule basis, using the "Schedule" tab in the navigation bar and selecting the schedule you want to edit. For details, please see: How do I edit a schedule?. Are you a visual learner? The following three minute video will walk you through Rachio's Weather Intelligence features, and will provide some guidance on how to use these features. Our servers get weather reports from our weather service, detailing the weather conditions before the watering time, checking 12 and 1 hour before the scheduled run. If these meet or exceed your pre-set threshold(s), the watering time is skipped (doesn't run that time). This feature will skip the watering schedule when it's raining; if the precipitation threshold is or will be met at the time the schedule starts, the schedule will be skipped. You can change this threshold under Weather Intelligence in the "More" tab. For more details, please see: Rain Skip FAQ. This feature is the newest addition to our Weather Intelligence family! Prevent waste by skipping waterings when high winds are likely to scatter water intended for your plants. 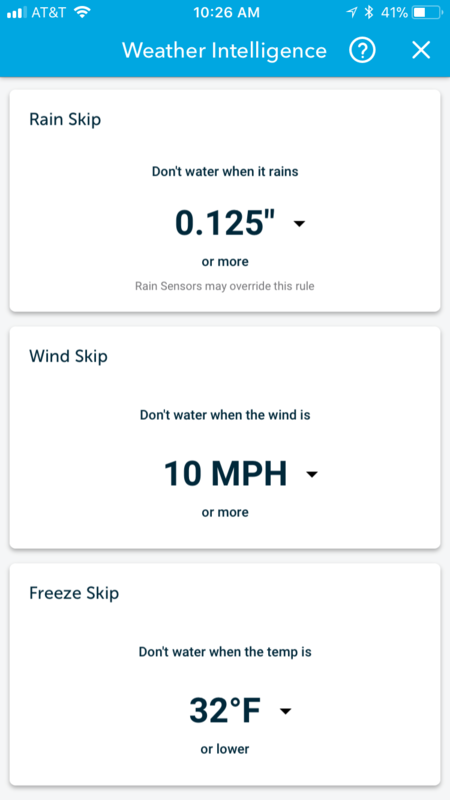 If wind speeds exceed your predetermined threshold, Rachio will automatically skip your scheduled watering.You can change this threshold under Weather Intelligence in the "More" tab. For more details, please see: Wind Skip FAQ. This feature will update your schedule durations on a monthly basis to offset seasonal weather changes. In short, durations increase from winter to summer and decrease from summer to winter. For details, see article: Seasonal Shift FAQ. This feature will skip the watering schedule anytime the soil moisture balance of ALL zones will stay above the allowed depletion threshold between until the next scheduled watering. For details, please see: Saturation Skip FAQ. This feature will skip the watering schedule based on the observed temperature; if the temperature threshold at or below at the time the schedule starts, the schedule will be skipped.You can change this threshold under Weather Intelligence in the "More" tab. For more details, please see: Freeze Skip FAQ. What should I set the Rain Skip threshold to? This is a user preference. The schedule creator defaults this setting to .125". If you wish to save the maximum amount of water and want to skip whenever possible, set the threshold to .0625" (trace rainfall). If you water infrequently you might want to skip only when there's been a good rain, set the threshold to 1". How do I know if my watering time was skipped because of Weather Intelligence? You will get a notification on your mobile device and an email to your account if you have notifications enabled. You can also see these notifications in the "History" tab of the Rachio App. Can I turn off Weather Intelligence emails & notifications? You betcha. From the "More" tab, click on "Account Settings", then "Notifications". For details, see article: App Settings FAQ.